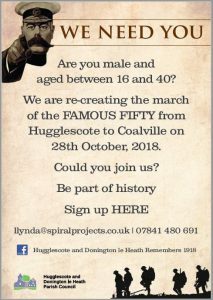 The Hugglescote and Donington le Heath Heritage Society are working alongside their Parish Council to organise a recreation of the march of the Famous Fifty, which will take place on Sunday 28th October 2018, from 1pm. The Famous Fifty were the first of the August 1914 volunteers from the Coalville area who joined up and went to France to fight on the Western Front. On October 30th 1914, they marched from St John the Baptist Church in Hugglescote to the train station in Coalville, with thousands lining the streets to wave them off.